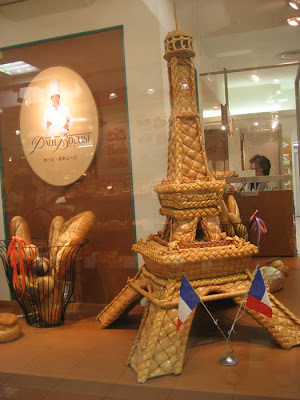 Yeast-based Eiffel Tower, Paul Bocuse Bakery, Daimaru Food Hall, Kyoto. Walking into Daimaru in Kyoto, I was completely unprepared for how freakin' awesome the food hall would be. I miss having Daimaru in Melbourne. When I was a kid, my family would go there every few weekends, walk around the stores, and end up at the cheap Japanese restaurant downstairs, eating super rich okonomiyaki, chicken teriyaki, noodles, and strange Japanese soft drinks. 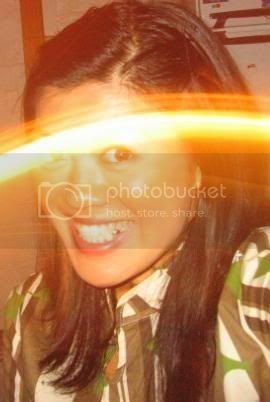 When I was 18, the whole thing closed down and I became deeply cynical. 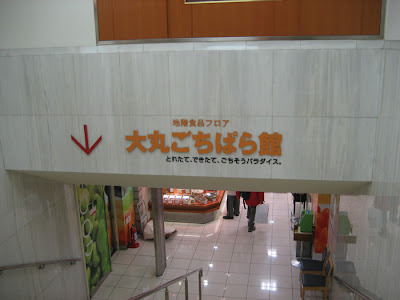 I have spent a considerable amount of time in Melbourne Central after Daimaru closed, but it was never the same. So, when we came across Daimaru in a swanky part of Kyoto, I just had to have a look see. Follow the arrow down to the food hall. The Daimaru Gochiparakan is a feasting paradise. 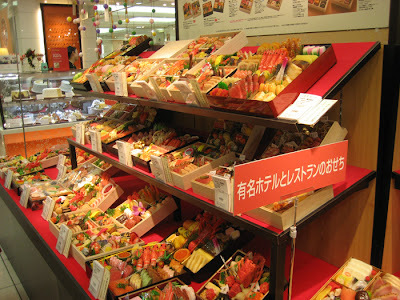 For those of you who remember Daimaru Melbourne's food floor, it's a bit like that. But at least 5 times bigger. And, let's face it, a zillion times better. Read on. First, the bakery. Having been separated from proper bread for a couple of weeks at this stage, I was overjoyed to stumble across the Paul Bocuse bakery. 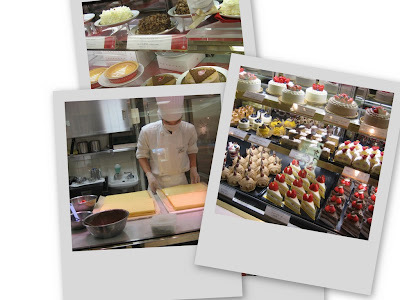 (A short while after this, I ate at the Paul Bocuse Brasserie Le Musée in Tokyo. Fabulous!) I'm also a big fan of Brioche bakery, on Commercial Road in Prahran, and knowing that baker Phillip Chiang trained at Paul Bocuse in Japan only added to my sense of anticipation. Wa-hey! I could not believe the amazing selection of baked goods! 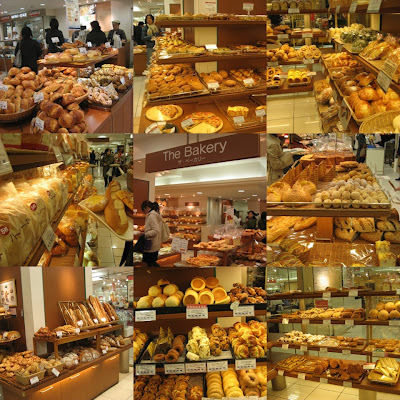 There were dozens of varieties of breads (from crusty crusty baguette, to soft white Asian-style loaves), biscuits, scones, pastries, danishes, meron-pan, muffins, pizzas, sandwiches, and more. If it contains flour and has spent more than 5 minutes in an oven, it's here. About an hour and $50 later, we dragged ourselves away from the bakery and had a look around the rest of the shops. 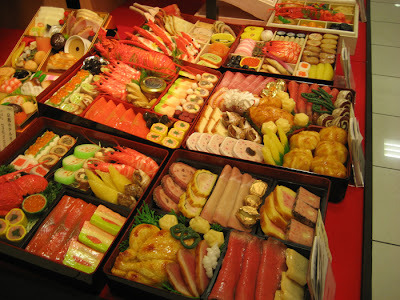 Below, we have osechi, special celebratory boxes for New Year's Eve. Just as German people take their Christmas very seriously (and let's not forget the Christmas markets), the Japanese make a huge deal of the New Year's holiday. (Click here to see a gorgeous sweets-based osechi from She Who Eats). These osechi are from famous hotels and restaurants. 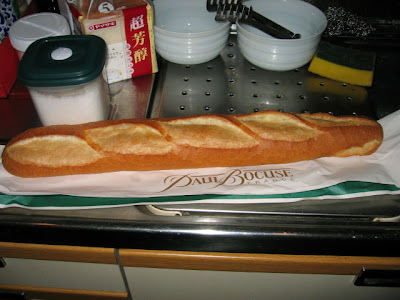 Perhaps the best thing we bought at the food hall was this baguette. Wow. I told you we were craving proper bread, yes? We were going to eat this baguette with dinner (spaghetti carbonara, cooked at the hostel), but we couldn't help ourselves, and devoured the entire thing before the pasta even cooked. Oh wow Sarah I have never seen anything like that. I would have gone completely mad in there. sounds like you are having a fantastic trip, Sarah! But did you have a Mont Blanc? That's the million dollar question in my book... as you maybe could guess! The food looks great. Is that $80 Australian for a cake? That is expensive. Must be a really good cake. Thanks for your comments! I'm amazed I didn't spend more money in there. I totally could have! Hannah - yup, I did get a mont blanc! In Tokyo though, so that's still coming up in a future post. Way yummy!